Part number: TEKTT1452 Tekin TT1452 HotWire 3.0 Bluetooth. Connect to Android or IOS devices using Bluetooth wireless technology without touching your car, or Windows computers and Android devices using the USB connection. This is a NEW Genuine Tekin HotWire 2.0 Interface PC interface w/ USB Cable TT1451. Part # TT1451. OTG is built in to the Hotwire 2.0 eliminating the need for an OTG cable. Allows modeler to set up their Tekin ESC through a PC interface. Part # TT1452. 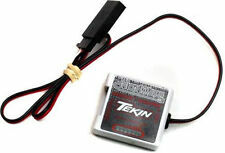 This is the Tekin Hotwire 3.0 Bluetooth ESC Interface. Hotwire 3.0 Bluetooth ESC Interface. Unlocks the full potential of the Tekin GEN2 ESCs with EZ Data Port. Nine Eagle Solo Pro. Wide selection. Trending at $59.84eBay determines this price through a machine learned model of the product's sale prices within the last 90 days. This is a Tekin TEKTT1451 Hotwire 2.0 Interface. Hotwire 2.0 Interface. OTG is built in to the Hotwire 2.0 eliminating the need for an OTG cable. Allows modeler to set up their Tekin ESC through a PC interface. Trending at $32.47eBay determines this price through a machine learned model of the product's sale prices within the last 90 days. Connect to Android or IOS devices using Bluetooth wireless technology without touching your car, or Windows computers and Android devices using the USB connection. Tekin HotWire runs on the following platforms. This is the Tekin Hotwire 2.0 Interface. OTG is built in to the Hotwire 2.0 eliminating the need for an OTG. FEATURES: Allows modeler to set up their Tekin ESC through a PC interface. Shock/Diff Oil. OTG is built in to the Hotwire 2.0 eliminating the need for an OTG cable. Allows modeler to set up their Tekin ESC through a PC interface. Manufacturer: Tekin. To run on Mac try using Bootcamp or Parallels. This is the Tekin Hotwire 2.0 USB Interface. Unlock the full potential of your Tekin ESC with the HotWire 2.0! Tekin HotWire runs on the following Windows platforms Most Android devices running 3.1 and higher will support HotWire connectivity. Part Number: TEKTT3848. Adapter cable for pre-GEN2 ESCs that do not have a Data Port. Connects through the ESC receiver plug. USB connection only, Bluetooth function not available on the below ESCs. Connect to Android or IOS devices using Bluetooth wireless technology without touching your car, or Windows computers and Android devices using the USB connection. com to get the latest software updates for all your Tekin products. Part Number: TEKTT1452. Connect to Android or IOS devices using Bluetooth wireless technology without touching your car, or Windows computers and Android devices using the USB connection. Tekin HotWire runs on the following platforms. Team Driver setup files are available to all, right off the Tekin website! Most Android devices running 3.1 and higher will support HotWire connectivity. OTG is built in to the HotWire 2.0 eliminating the need for an OTG cable. This is the Tekin Hotwire 2.0 Interface. OTG is built in to the Hotwire 2.0 eliminating the need for an OTG. Allows modeler to set up their Tekin ESC through a PC interface. jxs 02/25/14. To run on Mac try using Bootcamp or Parallels. Connect to Android or IOS devices using Bluetooth wireless technology without touching your car, or Windows computers and Android devices using the USB connection. This is the Tekin Hotwire 3.0 Bluetooth ESC Interface. Hotwire 3.0 Bluetooth ESC Interface. Unlocks the full potential of the Tekin GEN2 ESCs with EZ Data Port. Tekin RS Pro Black Edition BL Sensored/Sensorless ESC. This is a TEAM TEKIN TT1452 Hotwire 3.0 Bluetooth USB Interface. Manufacturer: Team Tekin. Model Number: TT1452. MSRP: 89.00. Category 1: Other Toys. Category 2: Radio Control Toys. Availability: Ships in 1 Business Day!. This is the Tekin Hotwire 2.0 USB Interface. Unlock the full potential of your Tekin ESC with the HotWire 2.0! Tekin Hotwire 2.0 USB Interface. Tekin HotWire runs on the following Windows platforms. Team Driver setup files are available to all, right off the Tekin website! Tekin Hotwire 2.0 Interface. Tekin HotWire runs on the following Windows platforms Most Android devices running 3.1 and higher will support HotWire connectivity. This is the HotWire Adaptor for use with the Tekin RXS, RX8G2 and RSG2 ESCs. HotWire Adaptor with Connectors jxs 05/09/13 ir/jxs &. Any and all warranties are covered by the respective manufacturers.